Teaching a robot how to use a sword seems like a terrible idea, given the inevitable robot uprising. And yet in this Japanese commercial, master swordsman Isao Machii does just that. 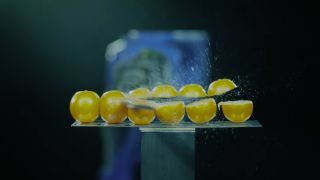 The robot goes through several tests, from a simple diagonal cut to some basic fruit slicing familiar to anyone who's played fruit ninja, all the way through to the "thousand cuts". In every case it closely replicates the movements of the modern-day samurai. The robot in question is the Motoman-MH24 - an industrial bot that's sometimes used in the medical field. It was built by the Yaskawa Electric Corporation. Not pictured: the moment when the robot breaks free of its bindings, crashes through a wall with its sword and is never seen again.